The premature passing of a musician makes us reach for the word ‘unfair’. We feel wronged by the loss caused to the art, robbed of newer music from the artiste. In U. Shrinivas’s case, for me, it was the disappointment caused by the unseasonable end to an exciting artistic evolution. 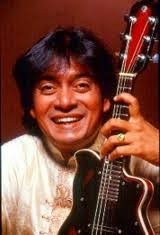 When Shrinivas exploded on to the scene, in the early-to-mid 1980s, his age and his unusual instrument created a splash. Once the audience came to terms with that, they were faced with something even more astonishing—his polish. He was, even in his earliest days on stage, a complete musician. He played compositions with absolute perfection, peppering them with his own witty sangatis, his imagination in raga alapana was limitless, somehow managing to be chaste and contemporary at once, and his niraval and swaraprastara showed a superhuman mastery over tala. In no time, barely-teenaged Shrinivas was being accompanied by the biggest names in the business, playing at prime slots at top-tier venues, both in India and around the world. The discipline of having to play so many concerts so early, and the pressure of doing well each time, perhaps led him to stick to tried and tested methods on the classical music stage. He did not experiment with form or substance. The cutcheri was always well-rounded, most often with a varnam, a kriti on Lord Ganesa, a ‘sub-main’ and then a ‘main’ in suddha madhyama and prati madhyama ragas, a judicious mix of talas, and a smattering of light compositions to finish. In the rendition of compositions, he rarely, if ever, took liberties. Each line was played twice, adhering almost pedantically, to his pathantara. His raga alapana essays followed the textbook step-by-step, swara-by-swara approach. There was never any discordance, odd gamaka, atypical resting point or odd phrasing. It was like reading Hemingway at his best. If there were flashes of genius, they were from within the box. Even when he occasionally threw up an odd swara-combination, like one old recording that I keep revisiting in which he dropped the panchamam in Hamsanadam for a few phrases, it came only as a flash—a passing quirk, if you like, before delivering us back in known territory. In one such instance, seven years ago, at the Music Academy, he announced, "Next, I will play a composition of Saint Tyagaraja in the ragam Gangeyabhushani. Evvare Ramayya." I was in the fifth row, sitting next to a westerner who knew a fair bit of Carnatic music. "That's raga number 33!" he told me, excitedly. I smiled. 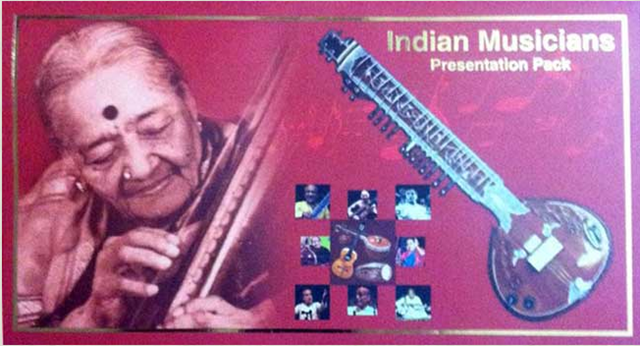 Foreigners were a staple presence in Shrinivas’s concerts by the turn of the century. He was, by virtue of being a pioneer and master of that nebulous genre called ‘world music’, the only exposure to south Indian music of any sort for most of them. Shrinivas started with the panchamam, a fleeting sound, before he turned to his right, and adjusted his amplifier. He was famous for these tics—always fiddling with his amplifier, his tuning heads. He started again, pa ma ga ma ga, a momentary pause, and then the shatsruti ri, drawn from the depths of the lower panchamam. I smiled again. Ri ga ma pa. Pa pa ma ga ma ga, and then a pause, and that ri again. This was standard fare. He signalled to the violinist to stop following him. Then he played sa-dha. He held the dhaivatam for hardly a second-and-a-half before turning to his violinist and smiling impishly. The damage was done. The dha sent a spear right through me—it took me a few seconds to even recognise the note. It had a similar effect on the foreigner who gasped audibly. It was like being thrown, suddenly, out of an aeroplane, and the surprise causing me to forget how to open the parachute. I knew that the suddha dhaivatam would come in this raga at some point. But Shrinivas had distracted me enough for those five seconds, toying with the familiar, before hurling me into the skies! The polish, honed by years and years of obsessive practice, no doubt, meant that there was little he couldn’t do. His phenomenal speed, his ability to play the most vakra of ragas without being daunted by its crookedness, or his skill of taking ragas with traditionally limited scope and finding in them infinite possibilities are all a testament to this. All this precision meant that he never seemed stretched on stage. Consumers of art want to see the strain that a performance brings, and they want to see the joy that accompanies this strain. Shrinivas was always smiling, always in control. Sometimes, I found him almost bored on stage. One evening, just before one of his concerts started in Bangalore, I remarked to a friend that he was avoiding the more rakti ragas, preferring to play the scale-based ones and simply letting his fingers frantically run up and down the fretboard. As if to mock me, he played Todi and Anandabhairavi that evening. A few weeks later, in another concert, he played a Sankarabharanam (Swara raga sudha, if my memory serves me right) for the gods. 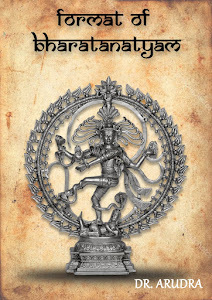 I still remember some of that mandra sthayi pondering, some of those phrases that glided between the panchamam and the gandharam, his flawless handling of the nishadam which was mostly pin-point drops from the shadjam. I remember that Sankarabharanam, most of all, for what is described only by that Tamil word nidhaanam—that perfect blend of depth and maturity. Many child prodigies disappear with time. Some burn out, some wither away, some are judged less favourably with age, and others just have nothing new to offer. Shrinivas was, I think, in between two phases in his Carnatic music. From the time he started, till a few years ago, he was playing in almost the same style. “If it ain’t broke, why fix it?” his music seemed to ask. But he had, in the last few years of his life, begun to descend deeper into the art, and it was showing in his performances. His old style was still there, its humour, its excitement, its refinement; but every now and then, a hitherto unseen wisdom and sophistication came to the fore. He was just beginning to break a barrier when he was taken away. That is why ‘unfair’ seems like the fairest word. He came to music as a finished product, but he left it, oddly, unfinished. It is gutting. We learn to our profound sorrow and shock that Mandolin U Shrinivas (45) passed away at a city hospital today after a period of illness. He was a gentle giant and one of our greatest musicians, truly worthy of being described as a genius. It is a great loss to the world of music. Our deeply felt sympathies to his family and friends. 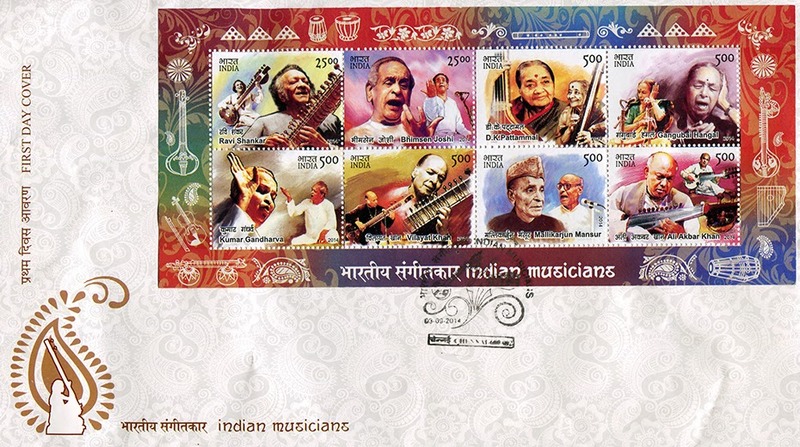 The Department of Posts has brought out Commemorative Postage Stamps of eight stalwarts of Indian classical music. 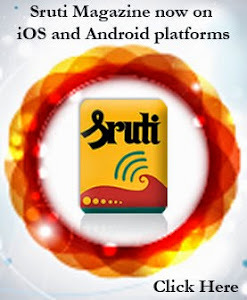 The album was released by the President of India Pranab Mukherjee at the Rashtrapati Bhavan on the morning of 3rd September 2014. Stamps celebrating the two Bharat Ratnas – Pandit Ravi Shankar and Pandit Bhimsen Joshi are in the denomination of Rs. 25. The stamps featuring vidushis D.K. 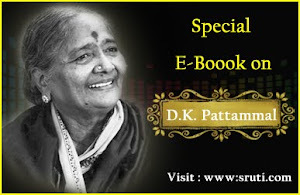 Pattammal (C-vocal) and Gangubai Hangal (H-vocal), Ali Akbar Khan (H-sarod), Vilayat Khan (H-sitar), Kumar Gandharva and Mallikarjun Mansur (H-vocal) are in the denomination of Rs.5. The stamps will be exhibited in the newly opened Museum of the Rashtrapati Bhavan which is open to visitors. The President congratulated the Department of Posts for their initiative and said the stamps will serve as a reminder of a golden era in the history of sastriya sangeet in India. 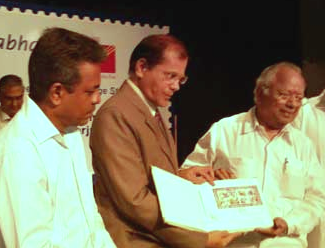 He said the release of the stamps was a celebration of the life, work and matchless legacy of the eight maestros who not only achieved personal perfection but had made extraordinary contributions to the development and evolution of the schools of music in which their talents were nurtured and honed. The President said it is comforting and invigorating to pause and reflect on our unique cultural heritage while facing the challenges of a globalized world, for music is spiritual nourishment for the soul and is at the core of our cultural and secular heritage. The set of eight stamps was released in the evening in various cities across the country – in Bangalore, Chennai, Mumbai and Visakhapatnam. T. Murthy, Chief Postmaster General, Tamilnadu Postal Circle, released the stamps album and the First Day Cover at the Brahma Gana Sabha in Chennai. It was received by noted art patron and industrialist Nalli Kuppuswami Chetti, in the presence of Mervin Alexander, Postmaster General, Chennai. The colourful stamps were printed at the Security Printing Press, Hyderabad. The Tamilnadu Postal Circle also issued a Special Presentation Pack priced at Rs. 400. Its novelty is that when you open the bright red folder with D.K. Pattammal’s picture, you can listen to a clip of nagaswaram and tavil music. It was apt that the function opened with a song rendered by young Tanujasree (daughter of Nityasree Mahadevan), fourth generation in the DKP family. The stamp release was followed by N. Vijay Siva’s vocal concert that was as classy as the first day cover. Maya Rao, veteran Kathak exponent, famous choreographer and founder-director of the Natya Institute of Kathak and Choreography, passed away on 31 August 2014 in Bangalore. She was 86. 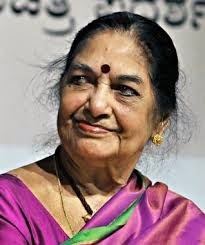 She is survived by her daughter Madhu Nataraj, also a well-known Kathak dancer and choreographer. Her family, fans and and thousands of her students all over the world mourn her loss.